Weed Maintenance There are 4 products. Screening And Beach Rake *Over. Remember Mary Anne, down by the seaside sifting sand? 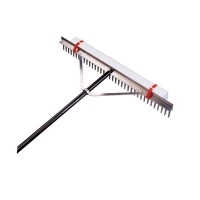 Bet she could have used this handy 36"-wide rake to sift or screen stones and other debris. The extremely long (66") powder-coated aluminum handle has a 6" vinyl grip and wraparound bracing to help you duplicate her efforts in comfort. 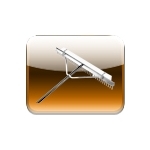 Use this along with the Lake Rake to clean up the mess. 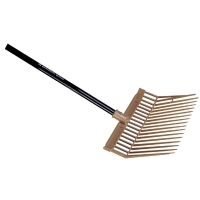 Pull in the weeds with the Lake Rake and use the TUFFork as a shovel to pitch them where you want them.The polycarbonate head with long, straight tines will withstand anything you can dig up. 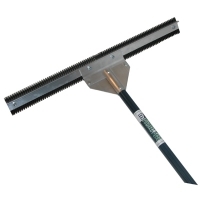 With 54" long aluminum handle, rust-proof and powder-coated.This item ships oversize. Oversize fees will be added to your shipping. 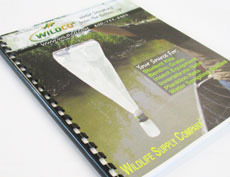 This is a good way to control lake and pond weeds without hazardous or costly chemicals. It scours the bottom of your lake, cutting off weeds at the roots. Throw it into the water, let it sink, and yank it back to snag the weeds. 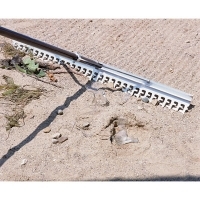 The reinforced 28" long serrated cutting blade withstands the heaviest load. Features an eleven foot, two-piece powder-coated aluminum handle that's lightweight and easy to use.